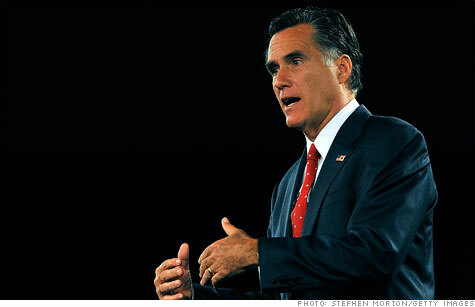 "If they cheat, there is a price to pay," Republican presidential candidate Mitt Romney said about China. NEW YORK (CNNMoney) -- Republican presidential hopeful Mitt Romney had some harsh words for China in his 59-point jobs plan Tuesday. Calling the country a "cheater," Romney promised to impose a variety of trade restrictions if China doesn't comply with intellectual property laws and allow its currency to float freely in foreign exchange markets. "I'll clamp down on the cheaters, and China is the worst example of that," he said as he presented his top ideas for job creation in Las Vegas. "If they cheat, there is a price to pay," he added. "I don't want a trade war, but I don't want a trade surrender either." Romney promised, if elected, he would immediately order the Treasury Department to designate China as a "currency manipulator" -- an official term that can trigger negotiations and possible sanctions under U.S. law. International leaders, lawmakers and Treasury Secretary Tim Geithner have long criticized China for intervening in the currency market to depress the value of its currency, the yuan. This policy, they say, makes Chinese goods artificially cheap, giving their exporters an unfair advantage in international trade. Over the last year, members of both the Senate and House have talked big about cracking down on countries that manipulate their currencies, but their bills have yet to make it to President Obama's desk for approval. The Treasury Department has tried to pressure China but has stopped short of labeling the country a "currency manipulator," a step last taken by President Bill Clinton in 1994. China is the United States' biggest foreign lender and one of the country's top export markets. The U.S.-China Business Council, which represents about 235 companies including many Fortune 500 firms, has repeatedly advocated against using the term, even though it agrees the yuan is undervalued. Romney said he would impose trade sanctions on China if it doesn't allow the yuan to float freely in foreign exchange markets. Citing fake Apple Stores in Chinese cities, his proposal also says he will crack down on intellectual property violations. "On many occasions, Chinese companies have simply reverse-engineered American products, with no regard for the patents and other protections of intellectual property rights that are crucial to our own economic well-being," the 88-page plan says. Romney's speech on job creation comes two days ahead of a major speech on Thursday, when President Obama is expected to announce his own proposals for job growth. Is China the key to GM's future?